An insulator is a substance that partly blocks or slows the flow of heat through it. Styrofoam is a lightweight plastic used in drinking cups. Styrofoam is a good insulator. A cooler or ice chest that is made of Styrofoam or some other insulator tends to block the flow of heat through it. Heat flows into buildings during warm summer months and from buildings during cold winter months. Energy must be used to cool buildings in the summer and heat them in the winter. 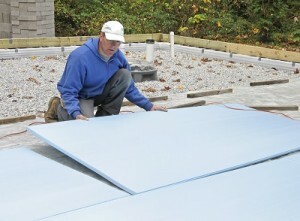 Since insulation can slow the flow of heat, the use of insulation in buildings can save energy. Some common home and building insulation materials include Styrofoam, polyurethane foam, and fiberglass. These materials are all good insulators, which means that they are poor conductors of heat. Placing these insulating materials on attic floors or in building walls tends to trap heat inside during the cold winter and keep heat out during the hot summer. Plastic foams filled with trapped gas tend to block heat flow. The chemicals used to make polyurethane foam can be sprayed directly into the spaces between walls. These chemicals produce carbon dioxide gas and polyurethane plastic. The gas tends to spread the polymer apart so the weight is mostly plastic but the volume is mostly trapped gas. Polyurethane also is used to insulate refrigerators, refrigerated trucks, pipes, and building walls. Fiberglass insulation is frequently used in attic floors to insulate homes. Also, fiberglass insulation is used to insulate the Trans-Alaska pipeline. This pipe carries oil 800 miles from Prudhoe Bay in northern Alaska to Valdez in southern Alaska. The crude oil that travels through this pipe is easier to pump if it is hot. An insulated pipeline requires less energy to keep the oil hot. Energy conservation becomes more and more important as energy costs rise. A great deal of energy is used to cool buildings in summer and heat buildings in winter. Less energy will be needed if buildings are well insulated and energy is not wasted. My team will contact you!